Share the post "Sleep Better with Sleepbuds by Bose"
What would you say about falling asleep to the calm sound of the raindrops or the peaceful waves on a beach. 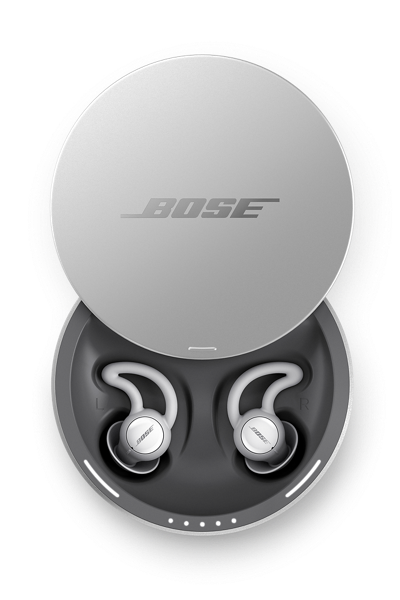 Now it is possible with the new product by Bose – Sleepbuds. They look like tiny headphones, but in fact they are noise-masking, uniquely designed for sleep. You can get them in three different sizes what makes them even more comfortable for everyone. They have rechargeable batteries with a charging case which is included in every kit. Of course you can use your standard headphones, but it is very uncomfortable and unhealthy. Sleepbuds were designed in order to provide you with healthy, calm and uninterrupted sleep. You can use the library in the Bose Sleep app on your phone and choose from over a thousand of fantastic sounds. Moreover, Bose uses 3D scans to understand ear geometry, because two ears are not alike. In this way they can find the right fit what is crucial to the sleepbuds’ performance. This product also has a function of waking-up alarms. This company is known for noise cancelling technology, but they discovered that when it comes to sleep noise masking is a much better option. I think that the Bose sleepbuds is a useful device because more and more people have insomnia problems. Due to stressful lifestyle, humans have difficulties with clear their head, these tiny headphones are remarkable for them. I am only worried about walking up alarm function. I am sure that this way of waking up can discourage potential user. Who wants to have Big Ben inside head in the morning? Fantastic idea! I am a type of person who has really light sleep, even a quiet sound coming from the kitchen or the bathroom wakes me up. I tried many things to reduce the sounds but nothing worked. Earplugs don’t isolate sounds completely and earbuds are uncomfortable. 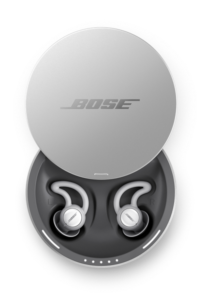 I am happy that Bose saw the problem and I will definitely try their product out. I appreciate that they thought of 3 sizes of earbuds and I guess that’s the key to calm sleep. Every ear is different and it does not matter that much when it comes to listening to music while standing or sitting, but with sleeping it’s crucial. It’s a pity that you didn’t include the information about the price. From what I checked, such headphones cost around 1000 pln. Of course I like the idea of creating gadgets like these, that not only fulfill relaxing functions but also help in sleep disorders. In addition, it starts to be noticeable that more and more companies emphasize the problem of insomnia, which many of us struggle with and begin to implement cutting-edge technology in order to improve the quality of sleep. It was clearly visible at this year’s CEST, where we could witness innovative devices such as wearable headband which uses EEG sensors as a brain training solution to help you sleep better, smart sleep mask or sleep-focussed meditation headband. It is evident that in this era of constant hurry and stress, people need some escape from their professional and working life. Therefore I am a big supporter of introducing gadgets aimed at calming, relaxing and pacification, however we should also not forget to be reasonable. Spending 1000 pln for headphones only to hear waves or raindrops as far as I am concerned, is a little too much. We can always do it using a smartphone! Nevertheless, I keep my fingers crossed for the further development in this field. Great idea, I personally suffer from insomnia and have a very light sleep. Some people spend thousands of dollars on special mattress, pillows, isolating curtains and many weird gadgets and this simple pair of sleep buds can really help!